Our simply irresistible, flavor-packed, Sun-Dried Tomato Best-o Pesto Pasta will make you feel like a five-star chef! Furthermore, this entree dispells the myth that scrumptious food that’s good for you means that it’s complicated. In fact, no matter how phenomenal our Sun-Dried Tomato Best-o Pesto Pasta tastes, this dish is downright easy to make! Indeed, our Sun-Dried Tomato Best-o Pesto Pasta recipe is by far one of my most favorite pasta recipes ever. And when asked to name an ingredient that delivers tons of flavor without needing a lot of fuss, tomatoes instantly come to mind. So, let’s talk tomatoes for a bit, shall we? Or more specifically, let’s talk about sun-dried tomatoes. Because they’re dehydrated, sun-kissed tomatoes are a concentrated source of both flavor and nutrients. Sun-dried provide vitamins C and K, iron, and lycopene, which is an antioxidant associated with lower risk of certain cancers. 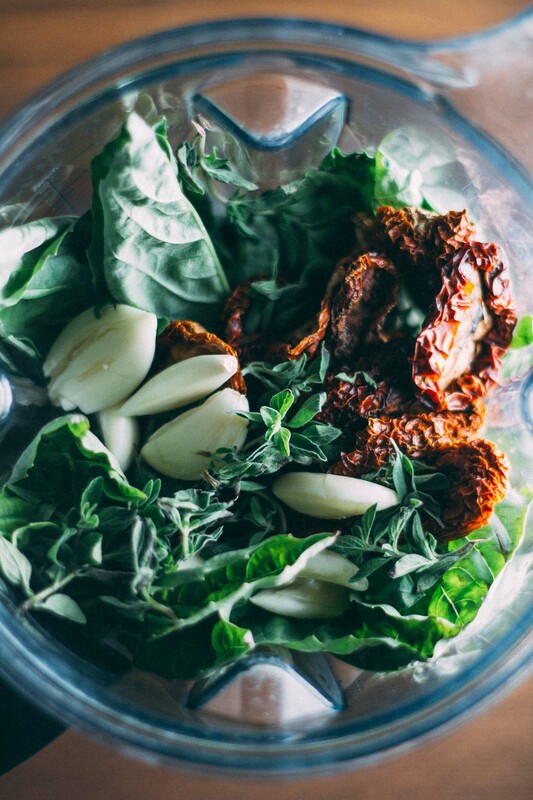 Additionally, just one cup of sun-dried tomatoes has 139 calories, 8 grams of protein, and 7 grams of fiber! You can find sun-dried tomatoes packed in oil or dry. I lean towards the ones packed dry in an attempt to use less fat in my dish. First, you get the water boiling for your choice of pasta. While the pasta water is boiling, put the ingredients for the pesto in your nifty blender adding the pasta water once your pasta has cooked. Blend the pesto & toss with the freshly cooked pasta! Sun-Dried Tomato Best-o Pesto Pasta is the most straightforward dinner go-to recipe I’ve ever created, and I am as proud as a new Momma of this one! The next time you’ve got that gimme pasta look in your eyes, give yourself fifteen minutes to whip this up. And the next time you have friends over for dinner, throw a bottle of red in the chiller, blend this no-cook sauce, toss it with some freshly cooked pasta and WOW your grateful guests like nobodies business! No worries – you can thank me later. As for me, I’m in Sun-Dried Tomato Best-o Pesto Pasta love. 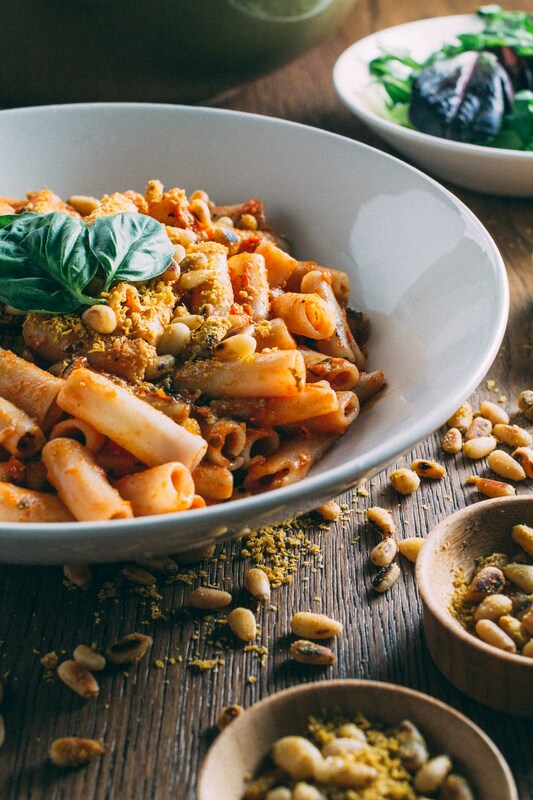 Serve Sun-Dried Tomato Best-o Pesto Pasta topped with our Plant-Based Pine Nut Parmesan which is equally enjoyable and pairs beautifully with this delightful dish. 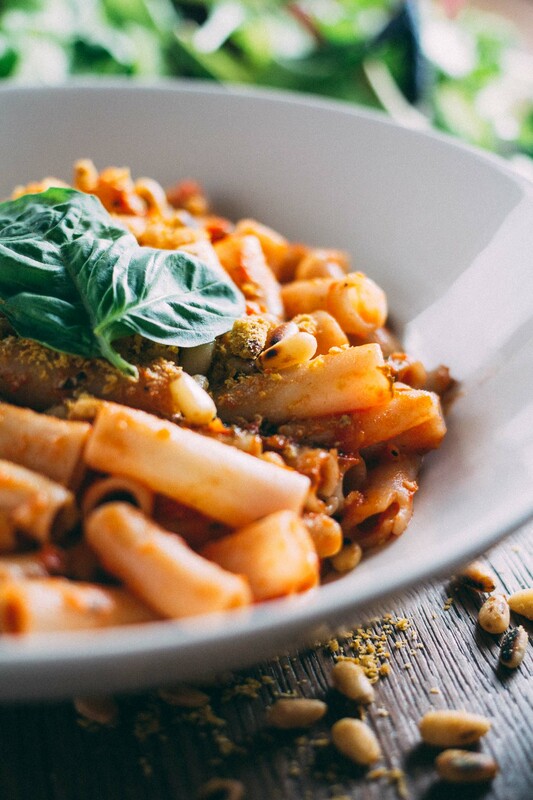 You don’t have to be vegan, vegetarian, plant-based oil-free or any other particular kind of diet following person to absolutely LOVE everything about our Sun-Dried Tomato Best-o Pesto Pasta! This blender blasted flavor explosion delivers the BEST Pesto bang for the buck that you’ll ever experience! 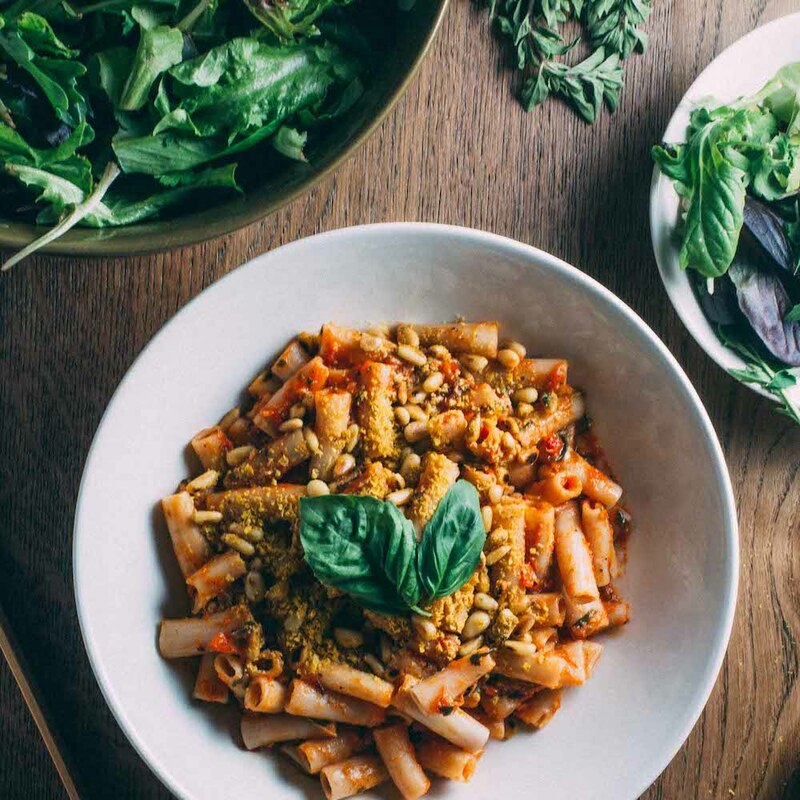 Sun-Dried Tomato Best-o Pesto Pasta is by far, the best tasting, no-cook tomato based pesto sauce we have ever tasted, and we’re sure you’ll love it, too! 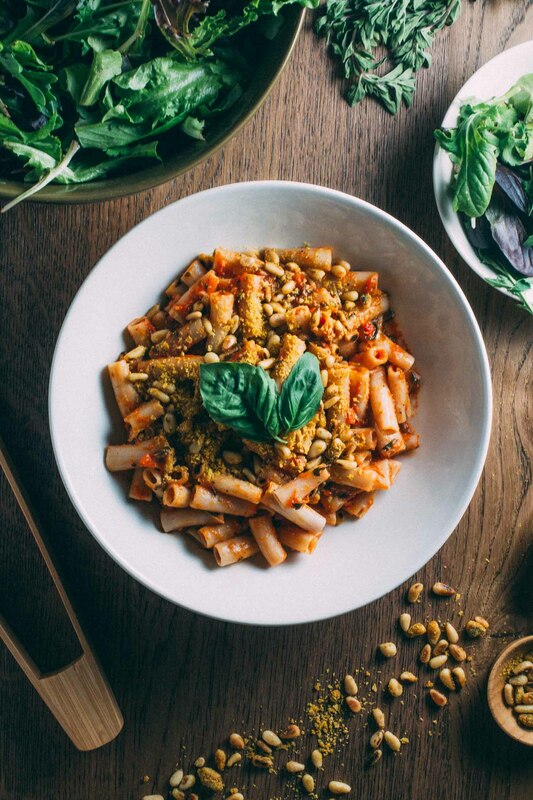 And for the best plate of pasta ever, be sure to top it with our terrifically cheesy, dairy-free, Plant-Based Pine Nut Parmesan! 16 oz pasta, cooked as directed - We use Trader Joe's or Tinkyada Gluten-Free Brown Rice Pasta Penne to keep this gluten-free, but you may use the pasta you prefer. one 14.5 oz can of tomatoes - We use these fire roasted tomatoes. 1/2 cup of vegetable broth - Since we cook and eat oil-free to reduce calories and fat for wellness, we use vegetable broth in place of oil. 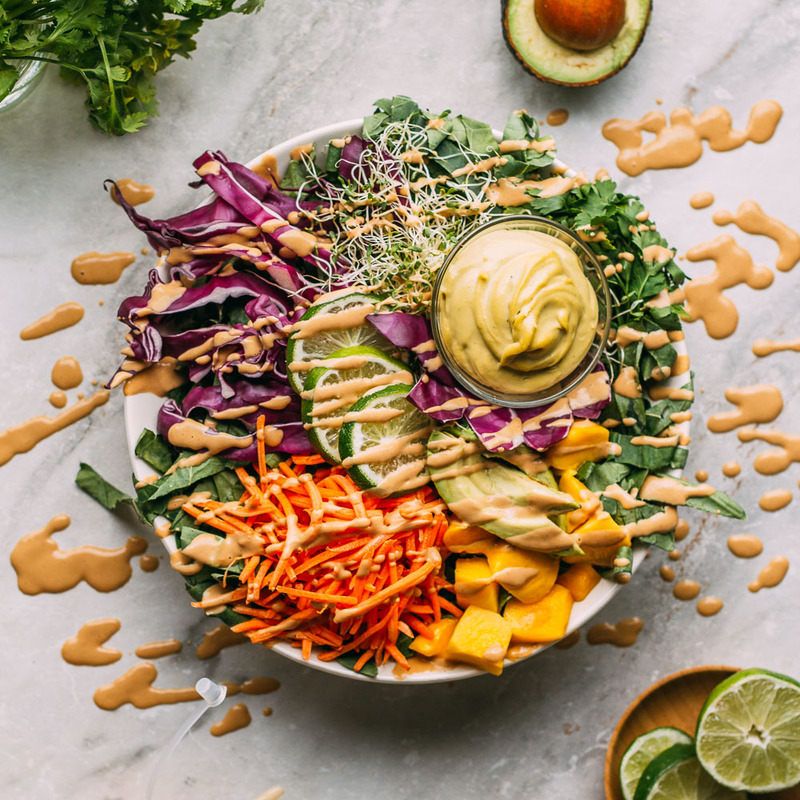 If you prefer the sauce to be a little richer, in place of the broth you may opt to use unsweetened plant-based milk or a splash of unrefined lite coconut milk. 1 to 1 1/2 cups reserved pasta cooking water or additional vegetable broth - Start with just one cup and taste. To begin, prepare the pasta according to package instructions remembering to reserve some of the pasta cooking water. And as your pasta cooks, gather the ingredients for the no-cook sauce. 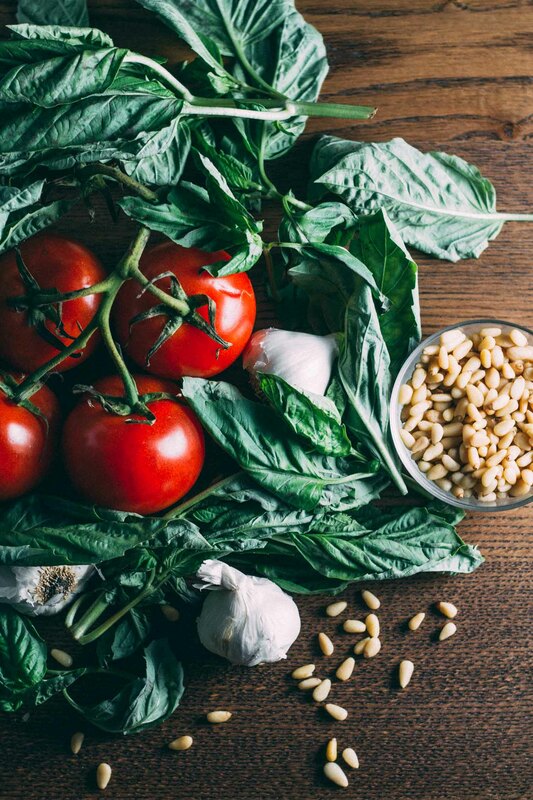 In a high-speed blender add the fire roasted tomatoes, broth or plant-based milk, sundried tomatoes, basil, oregano, garlic, and one cup of the reserved pasta cooking water. Give it a mix whirl in the blender, stop and taste for salt and season as needed. You can add a little more of the pasta cooking water if you prefer the sauce consistency to be thinner. I typically add about one to one and one-half cups of pasta water. Finally, pour the sauce over the cooked and drained pasta, and gently toss to coat the pasta with sauce. 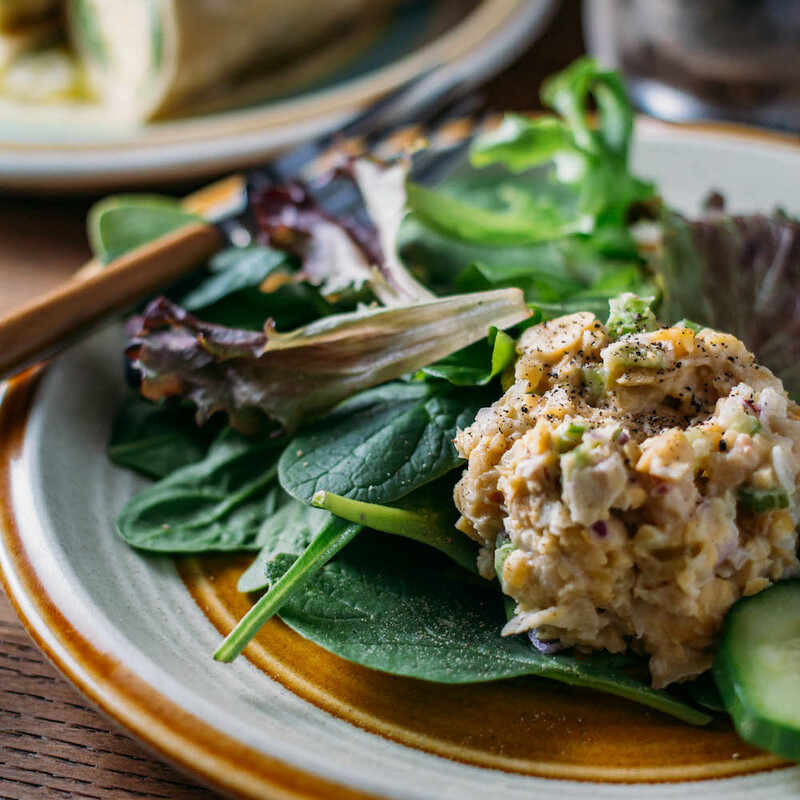 Sprinkle each serving with a generous portion of our cheesy Plant-Based Pine Nut Parmesan, serve with a side salad and enjoy! While I prefer the taste of fire-roasted canned tomatoes to that of regular canned tomatoes for use in this recipe, any variety of canned tomato will work well in this dish. The fire roasted variety adds a subtle little note in the flavor profile that I have come to appreciate. Ingredients listed in orange means that you can click on the orange word and it will take you to an Amazon link where the item is fully described and available for purchase if you like. I offer this feature because some ingredients may be unfamiliar or hard to find in some areas of our beautiful world. We often buy organic ingredients in bulk to save money as is the case with this brand of organic sundried tomatoes. Here's an article I found interesting regarding the nutritional benefits of sun-dried tomatoes preserved without oil. 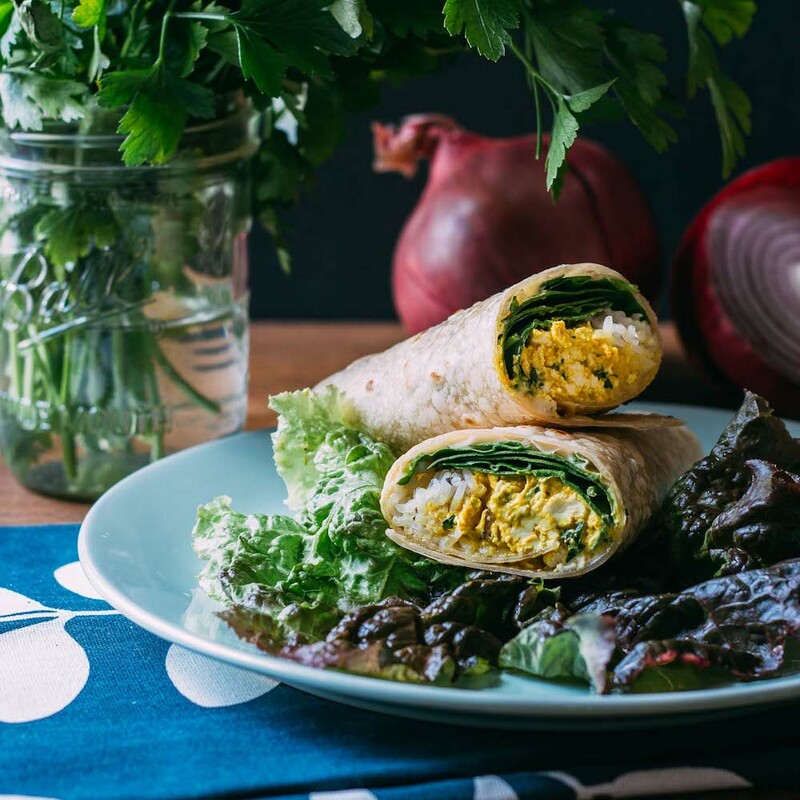 In case you are new to cooking oil-free, the calorie and fat count for this recipe are way lower when you switch out the olive oil for one of the refined oil-free options any unsweetened plant-based milk, lite coconut milk or better still, vegetable broth. You should try it using one of these options... it's a change that your waistline and overall wellness will appreciate! For example, the calories in one serving go from 268 to 150! Saturated fat drops from 1.9 g to ZERO!